Azerbaijani Defence Minister Col-Gen Zakir Hasanov has ordered the army’s high alert in the wake of the recent statements of Armenian political and military leadership boiling down to the refusal to abandon the occupied lands and a threat of seizure of new territories. "Touching on irresponsible statements by the military and political leadership of Armenia, Col-Gen Zakir Hasanov noted that this will lead to an increase in tensions along the front line. The defense minister emphasized that all the drills held according to the plan were aimed at conducting large-scale offensive operations. The minister gave specific instructions to commanders of all levels to organize constant monitoring and control of the actions of the enemy, to give a decisive response to its possible provocations, and to be ready for the start of active military operations at any time,” the press release of the Defense Ministry reads. In the meantime, Nato credited Azerbaijan for military cooperation and being helpful in its efforts to fight terrorism in Afghanistan. Baku-Tbilisi-Kars railway contributes to the success of the mission Resolute Support mission, NATO Secretary General Jens Stoltenberg told a meeting of the foreign ministers of the military alliance in Washington on April 3-4. Addressing the meeting on the 70th anniversary of NATO, NATO Secretary General Jens Stoltenberg described Azerbaijan as a close partner of the alliance, working in close cooperation with NATO for international peace and security. Referring to the secretary general’s statement, Baku-based security expert Arzu Nagiyev said it indicates that the alliance views Azerbaijan as a close partner. “There are a series of important factors. Without being a member of any military alliance, Azerbaijan is in significant military cooperation both with Russia and NATO. We participate closely in all NATO events. Simultaneously, we do not undermine the balance due to tension between Russia and NATO and have hosted a number of NATO-Russia meetings,” the security expert said. In his statement to the press, the NATO secretary general stressed that Azerbaijan is a close partner of the military alliance and works closely with NATO to restore international peace and security. 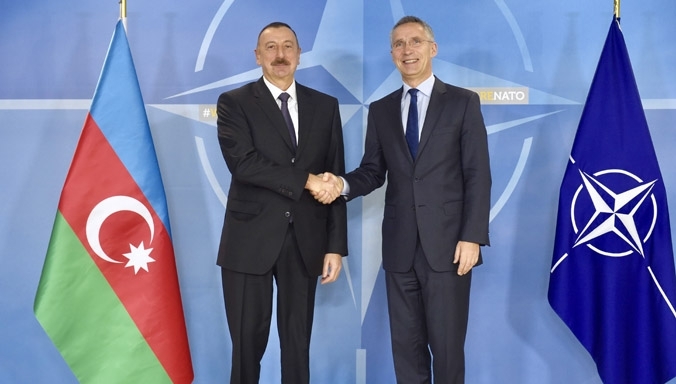 Stoltenberg also said that Azerbaijan, under the leadership of NATO, introduces military and multimodal transit support within the framework of the Resolute Support mission in Afghanistan. The official opening ceremony of the BTK railway was held in Baku October 30 last year and was built on the basis a Georgian-Azerbaijani-Turkish intergovernmental agreement. The railway’s peak capacity will be 17 million tons of cargo per year. At an initial stage, this figure will be one million passengers and 6.5 million tons of cargo. Azerbaijan is an important and reliable NATO partner, US ambassador to Azerbaijan Earle Litzenberger said. The envoy made the remarks in his video message on the occasion of the 70th anniversary of NATO. “Azerbaijan is an important and reliable NATO partner through its commitment of troops and supply routes to help provide security in Afghanistan and through its valuable contributions to fighting global terrorism and drug trafficking. We here, at the US embassy in Baku, look forward to finding new ways our two countries can work together and as partners in NATO committed to promoting and preserving peace and stability throughout the world,” Litzenberger said. “We must overcome our differences now because we will need our alliance even more in the future. We face unprecedented challenges - challenges no one nation can face alone,” NATO Secretary General Jens Stoltenberg said. The Senate is due to vote later this year on whether North Macedonia can become NATO’s 30th member. Trump has ruffled feathers among European allies by repeatedly saying NATO nations need to pay more for their militaries and ease the burden on the United States. Stoltenberg said NATO member countries are adding billions to their defense spending - $41 billion in the last two years. He expects that figure to rise to $100 billion next year.